“This is a call from your favorite grandson,” said a man’s voice when Stow resident Eveleth Cowles, 86, picked up the phone at her home. But Eveleth only has one grandson and he has a Southern accent, unlike the voice on the other end of the phone, she quickly thought to herself at the time. As she listened to the caller claiming to be her grandson, she knew it was the beginning of a well-choreographed scam targeting seniors. The “Grandparent Scam” puts seniors on the receiving end of calls, whereby the caller claims to be their grandson or granddaughter. That “grandchild” claims to be in a desperate situation that requires money to be wired or sent on a pre-paid card, as soon as possible. There may be descriptions of a car accident, stolen wallet or unfair arrest requiring a large bail to be posted for the grandchild to be released and returned home. 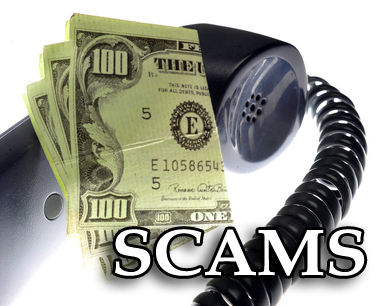 No matter what the situation described in the call, the scammers are out to get money from seniors by playing on their emotions and family ties, according to Stow Police Detective Mike Sallese. Eveleth and her husband John, 89, self-described as “elderly, but still sharp,” were not the only ones to get such a call. The same week, another Stow couple, also seniors, came into the police station to report a similar phone call. “It’s rampant right now,” said Sallese of the scam. Eveleth credits her awareness of the scam with a presentation put on at the Council on Aging some time ago, where the speaker described the tactics taken by these callers to convince a senior that everything is legitimate. “And he was doing just what he said,” Eveleth said of her caller. While the caller talked on and on, Eveleth also did a bit of observation work. “I could hear people in the background. It sounded like when a credit card company calls you, as if they were all saying the same thing but on different calls. I knew something was up,” she said. Though the caller tried to convince her that he was her grandson, Eveleth did not take the bait. “I asked him what happened to his accent,” she said, revealing that the caller sidestepped that question, moving on to instead describe his desperate need to for emergency funds. “I’m just sorry that I hung up before finding out where he wanted me to send the money,” she said, thinking that might help law enforcement track down this individual. Sallese said there are many different versions of the Grandparents Scam with very little chance of generous seniors getting their money back. It’s best to check with other relatives if you receive such a call, or ask a number of clarifying questions that require a specific answer that only your true grandchild can provide. “Do not send any money,” is the best advice that Sallese could give, until the identity of the caller can truly be verified. He also urged homeowners of all ages to be aware that the Driveway Scam is starting up again, whereby a contractor will appear at your door with a load of “surplus” paving materials, supposedly left over from a job already finished. He will offer to pave your driveway at a very low price, “to get rid of the excess material,” explained Sallese. He may start the job and then demand 10x more money than he quoted you. If you don’t pay, your driveway will be only be partially finished and often left in an unusable condition, said Sallese. He urged residents never to accept offers from contractors offering work through a door to door campaign. It will most often prove to be a regrettable decision.